If you're a 406 Coupe owner, you will already know how relatively rare they are. You'll also know how difficult it is to find the right technical support or advice without making frequent and expensive trips to the Main dealers. The 406 Coupe Club provides the means for you to discuss all aspects of owning and maintaining a 406 Coupe with fellow owners and others with either knowledge of, or an interest in the Coupe model. If you have a problem or a question about your Coupe, there will undoubtedly be someone in the club who will be able to offer you some advice or the technical support you need. You may even find someone local who can actually help you do the work required or at least suggest a decent local garage. 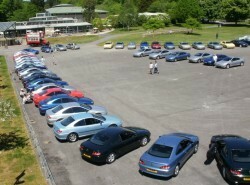 As a club we also arrange meetings all over the UK. These range from small local events to our much larger full club meetings where we have had more than 80 coupes in attendance on one occasion. Whether a large or a small meeting, these events are always a good day out and all the family are welcome to attend. No. You can access the site completely free of charge. However, there is the option of making a donation to become a Full Member. Am I expected to pay? No. You don't have to be a Full Member to use the site, or attend our club meetings. It has never been the intention of the 406 Coupe Club to make profit, only to bring people together with a common interest. Whether you choose to contribute financially is up to you. Then why is there an option of Full Membership? The donations we receive from club members assist us to cover the running costs of the site in terms of hosting fees. They also allow us to make purchases on behalf of the club. Some recent purchases have included our framed banner, the two sail flags and the gazebo we use at our club meetings. We have also funded the initial outlays on items such as the Coupe Club tax disc holders, the window graphics and the i-spy cards that are now sent out to new joiners and those who are renewing their membership. We also use the donated funds to pay for items that we sell in the club shop eg. Club mugs, polo shirts and our annual club calendar. Without the generous support of our members, we would not be in a position to be able to run the club and provide the services in the way we believe it should operate. If I become a Full Member, what will I get in return? You will receive a 406 Coupe Club membership card. This will entitle you to generous discounts from a number of large organisations that supply various goods and services to car club members. The list of organisations offering such discounts is regularly being updated, and can be found in the "affiliates section" of the site. We are always looking out for more organisations who may be willing to offer further Club discounts; the full benefit of the discount is passed on to our members. The more Full Members we have, the more negotiating power we have. 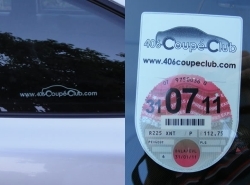 You will also receive a pair of 406 Coupe Club window stickers, a tax disc holder bearing the club logo, and some "i-spy cards" which are like small business cards and contain information about the club, which we hope you will affix to any 406 coupe you find that is not already displaying the club window graphics. It's hard to believe but there are still Coupe owners out there who don't even know that there is a 406 Coupe Club. Although we maintain that donations are voluntary, the usual donation is £15 for 12 months membership. That's just £1.25 per month to help keep the site running, and to do your bit to assist us maintain the club in the way we think you would want us to. section. Select the "purchase" or "renew" membership option as appropriate. Please note that you must have an account on our website to become a member. And when joining, please ensure you provide your correct postal address so that your membership pack can be sent to you. If you have any further questions about becoming a club member, please feel free to contact any of the club team.